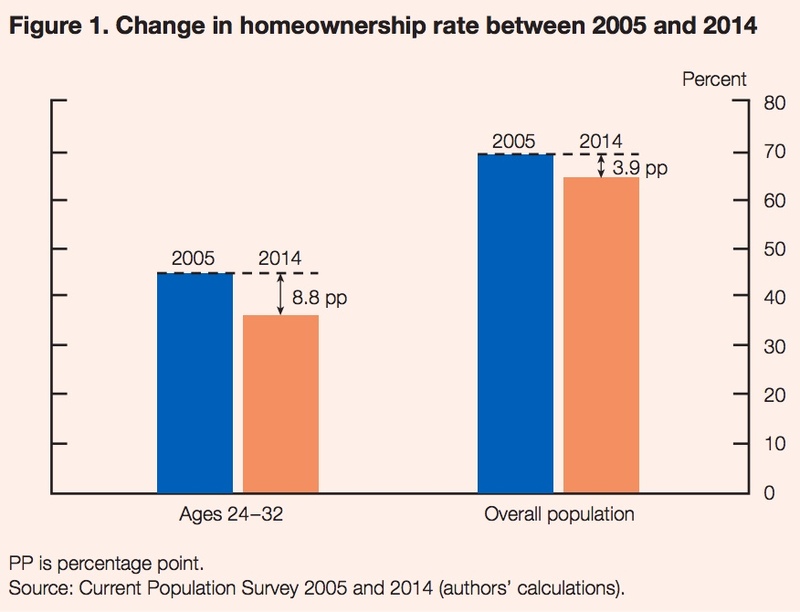 It's widely known that homeownership rates are historically low and that they peaked at 69 percent in 2005. They began dropping a year or two later and had lost about 4 percentage points by 2014. They did not stabilize until 2016. The 2005-2014 drop was most dramatic among young adults. Three analysts from the Federal Reserve Board's Division of Research and Statistics have now drawn a direct line between their 9-percentage point decline in homeownership and student loan debt. 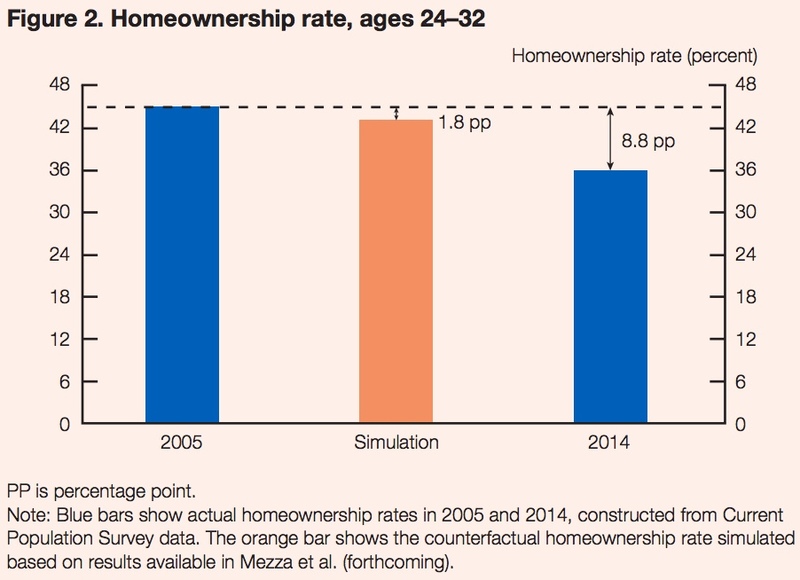 The three, Alvaro Mezza, Daniel Ringo, and Kamila Sommer, looked specifically at household heads aged 24 to 32. Among those in this category in 2005, 45 percent owned their home, but just 36 percent did in 2014. Over that same time frame, per capita student debt levels went from $5,000 in 2005 to $10,000 in 2014 and the total has reached $1.5 trillion. This age group commonly reports in surveys that their student loan debts are preventing them from buying a home. The authors say the relationship between the ability to buy a home and the debt accumulated while gaining an education is complex. The debt and the payments necessary to retire it may reduce the ability to qualify for a mortgage, while the education it furthered may lead to higher incomes and better opportunities for employment. "It is not immediately clear whether, on balance, the impact of student loan debt on homeownership would be positive or negative," they say, so they attempted to separate the impact of additional debt from any positives arising from the education. First, they calculated the probability of homeownership for each individual in their 2005 sample using information on credit, educational performance, and student debt. They then raised the debt level distribution for the group to that found in the 2014 population, holding the demographic, economic, and educational characteristics constant. The fraction of individuals who had borrowed to fund their education increased from 30 to 40 percent, and the amounts borrowed at the upper end of the distribution increased more rapidly than in the middle. While individuals at the median did not borrow in either period, debt levels at the 95th percentile grew by about $6,500. The increase in student debt between the two periods reduced the homeownership rate by 2 percentage points, therefore accounting for about 20 percent of the 9-point decline. This represents about 400,000 individuals who would have purchased a home in 2014 were it not for their debt. The study also found that every $1,000 increase in debt caused a 1-to-2-point drop in an individual's likelihood of homeownership. The authors caution that any interpretation of their data must consider that those buying in 2005 faced different lending condition than those buying post-recession when loan underwriting may have become more sensitive to student loan debt. There are several channels through which student debt can affect homeownership. One is credit scores. The study showed that higher student debt early in life leads to lower credit scores later on, all other factors being equal. They also found that increased student loan debt was more likely to mean a default on that debt which creates a major negative effect on credit scores. Although, as an aside, they also found the most likely borrowers to default were those with relatively small amounts of debt. They speculate that those were students who were less likely to have advanced degrees an may have dropped out of college or attended those with one- or two-year programs. There was also a correlation with default and attendance at a for-profit institution. The effect on credit scores has implications beyond homeownership, affecting access to and the cost of all types of credit. The authors conclude that, while an investment in post-secondary education is likely to have largely positive and substantial returns, burdensome debt may be lessening those benefits. "As policymakers evaluate ways to aid student borrowers, they may wish to consider policies that reduce the cost of tuition, such as greater state government participation in public institutions, and ease the burden of student loan payments, such as more expansive use of income-driven repayment."